There are squashed slug guts on the floor of my hut, which is located about one-third of the way up Mount Kilimanjaro. I feel bad for the slug, who just sort of exploded under my sneaker when I was looking at the drawings on the hut’s roughhewn walls. But I’m so damn happy about all the views from this lodge that even the sight of a split-open slug is worthy of remark. Obviously, we came to see the Mountain (not the slug) and we’ve been treated to beyond-expectation views of the “Roof of Africa,” despite an ever-changing weather pattern here at 8,000 feet. I’m not sure how people actually climb Kilimanjaro since our party of four is rendered breathless by the two-minute ascent from our huts to the main lodge. Yesterday, I tried to dance with the mamas from the coffee-making Chagga tribe and I feared the event might turn into a burial rite for me. So, who is this “we” of whom I speak? 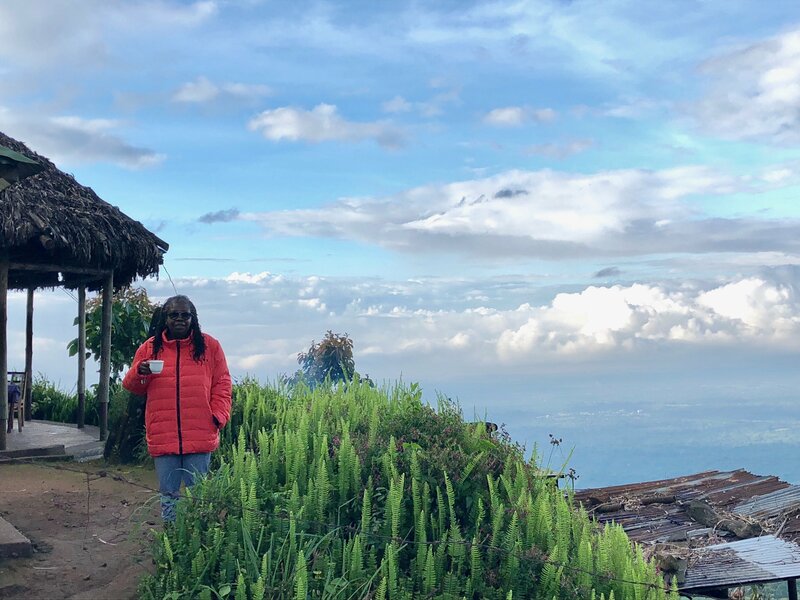 This party of four hanging out on the side of the world’s most distinctive-looking mountain, memorialized in a book by Ernest Hemingway and beloved by millions of Tanzanians? 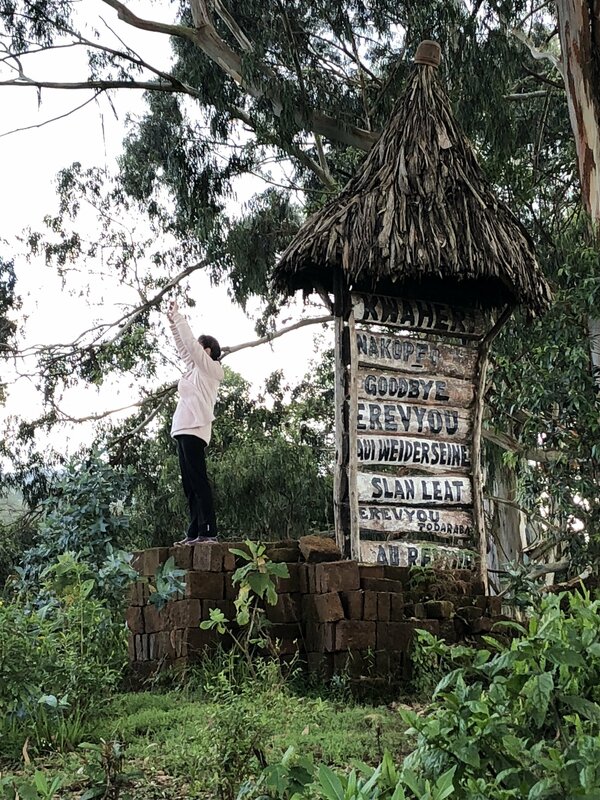 There’s me, who wanted to play out an idea for a book – Hotel Kilimanjaro – that starts and ends with hotels named Kilimanjaro and tells stories about travel post-alcoholism. How does sobriety change what you experience? What do you see? Where you go? This trip to Mount Kilimanjaro is the proof that I’ve come a long, long way since 1987 booze-filled antics in a hotel named Kilimanjaro in Dar Es Salaam, Tanzania. Three friends came along to Kilimanjaro for their own reasons. Two of them, Pamela and Karen, were Peace Corps volunteers in Kenya with me 32 years ago. They’ve been through their own trials and tribulations – lives that have run the gamut from childhood poverty to adult divorces, and familial Alzheimer’s disease. Neither Pamela nor Karen had ever been to Tanzania but seized the opportunity to revisit East Africa and see Kilimanjaro. A more recently-made friend, Stacey, with whom I worked at UVM before I left for Ajman, made the random decision to join us after reading about the concept for Hotel Kilimanjaro in one of my newsletters. 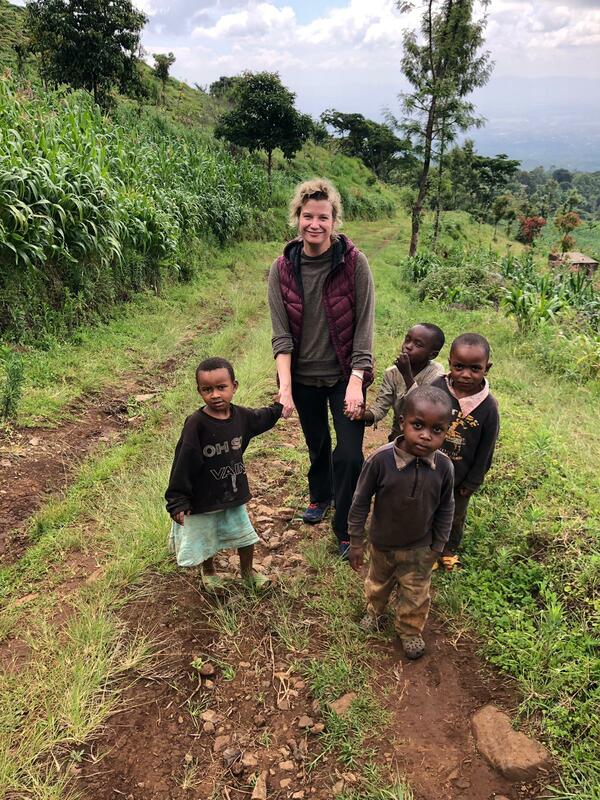 She is recently divorced, like Pamela, and felt it was exactly the right time to take a vacation from her work as the director of Vermont’s largest methadone clinic and fly half-way around the world to look at Kilimanjaro for three days. Her wicked sense of humor and joie de vivre has earned her a place of honor in the lodge and in our hearts. 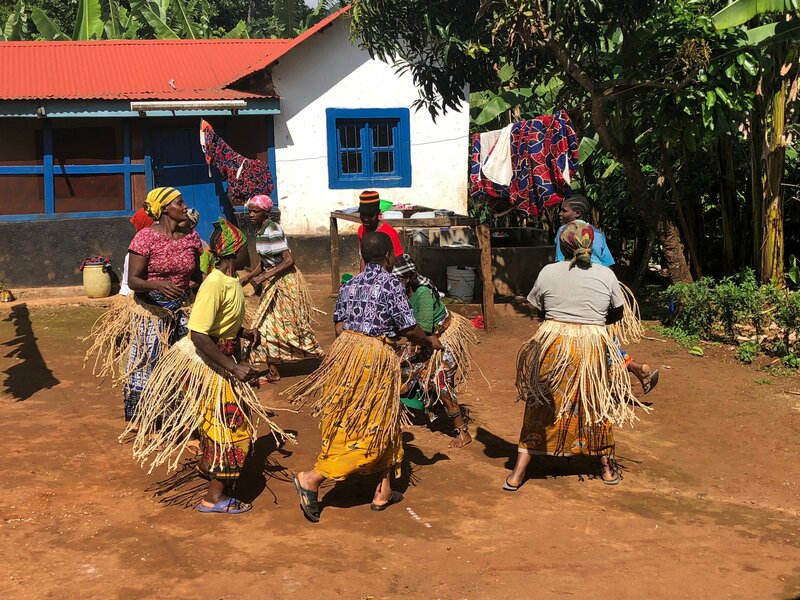 Over the last two days, we’ve taught Tanzanian school children to sing “Head, Shoulders, Knees, and Toes.” We’ve watched the process of taking coffee from crop to cup with the aforementioned dancing mamas. 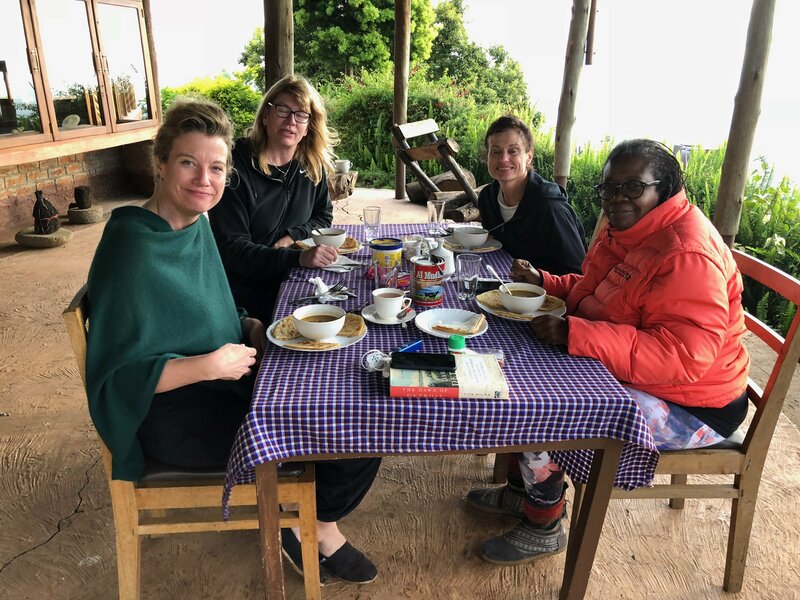 The process took three hours – using manual machines, firewood and the divine power of song – but our foursome’s uncharacteristic patience was rewarded with the best cup of coffee we’ve ever had the pleasure of drinking. For the most part, though, we spend our time traipsing around lodge grounds trying to get the best view/photo of Kilimanjaro. This morning, we carried plastic chairs to a small clearing outside the property and plopped down to wait for the clouds covering Kilimanjaro to pass. The process of waiting for the Mountain to come into view is symbolic of all that went into getting here – the years, the drinks, the illnesses, the medicines, the marriages, the children, the divorces, the deaths, the leavings, and the returnings. The sporadic, breathtaking views of Kilimanjaro are similar to those profound moments when you emerge from a long patch of darkness. 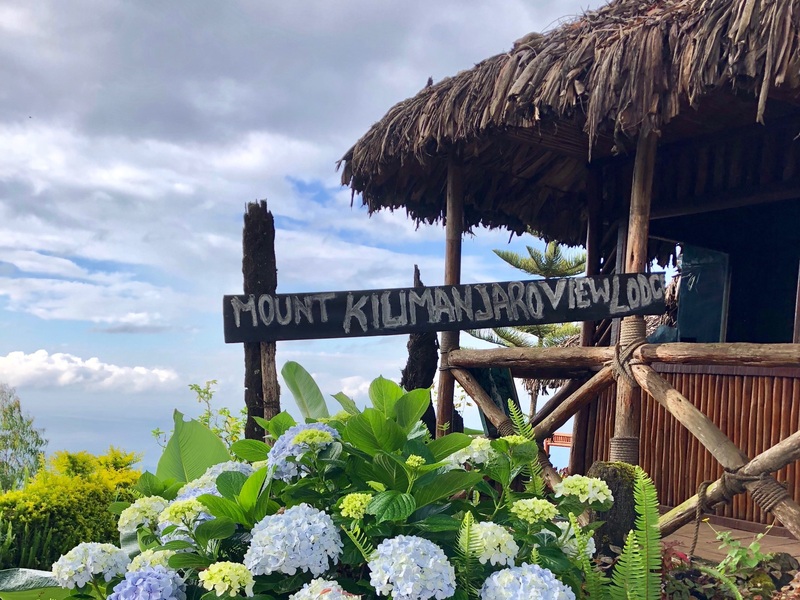 I may have chosen the Mount Kilimanjaro View Lodge on a whim but I’ve come to believe that this Mountain and these accommodations may have chosen us on purpose. 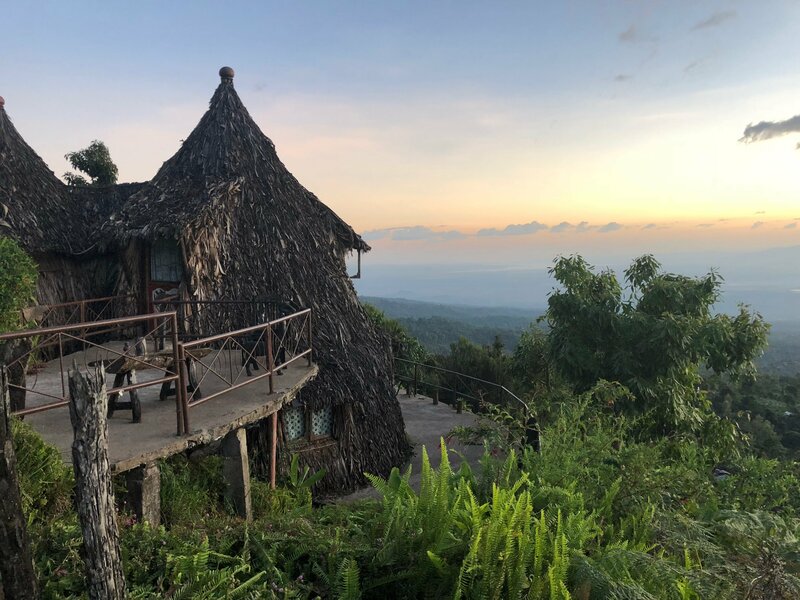 Hotel Kilimanjaro is much more than the title of a book — it’s the residence of redemption. I may not get to accompany the author on her sojourns for her writings, but I feel, as a strong supporter of her wanderlust and her emotional being, as her husband, that I am sort of an associate producer of these voyages. I am not a sycophant but one who loves his wife, unconditionally. I never question the motive nor do I ask for the full explanation because I know, in the end, it (the visit or trip) will always result in a wonderful post like this one. As we say in Canada, thank you very much Nancy!